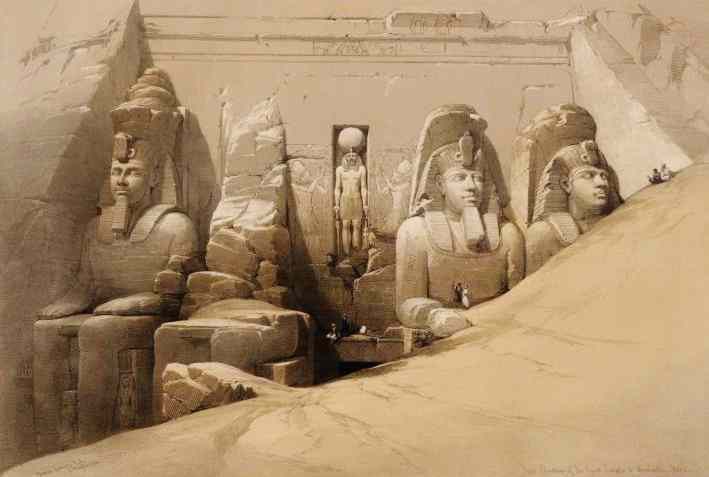 Pharaoh Rameses II (Ramesses II - ruled 1279-1213 BC) ordered the building of two temples at Abu Simbel (Abû Sunbul, Aboo Simbul or Abo Simble), in Nubia, at the far southern reach of his empire. Nearly the entirity of the larger temple, including the entrance and most of the now famous statues of Rameses, was covered with sand for many centuries and forgotten. The author of our first description, John Burckhardt, is credited with the discovery of the larger Ramesses temple, although, as he would say, the nearby Queen's temple was well known at the time. 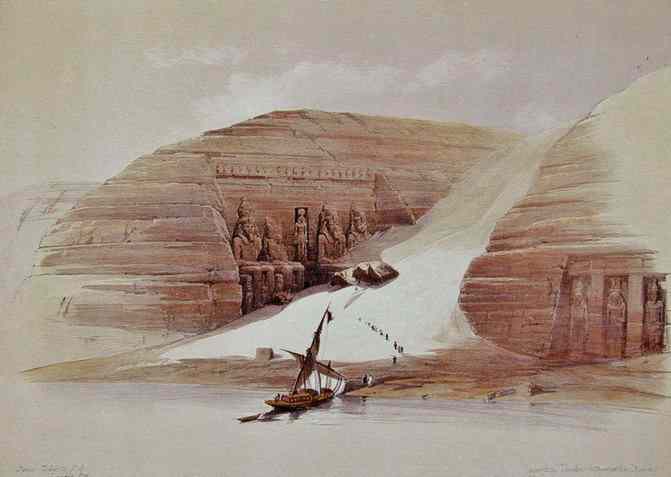 The entrance to the larger temple of Ramesses at Abu Simbel was cleared by Giovanni Belzoni in 1817. Both of the Abu Simbel temples were moved to higher ground in 1963 - 1968, before the completion of the Aswan high dam which would have flooded them. The $40 million project is the greatest feat of rescue archaeology ever attempted. The Rameses temple was cut from the cliff, segmented into 1036 numbered blocks weighing a total of about 15,000 tons and reassembled in a concrete shell above the new waterline. The broken torso of the second Rameses was replaced at the feet of the statues. The entire complex now looks out over Lake Nasser and the large number of tourists who visit every year. I supposed I had seen all the antiquities of Abu Simbel, so I was about to ascend the sandy side of the mountain by the same way I had descended. 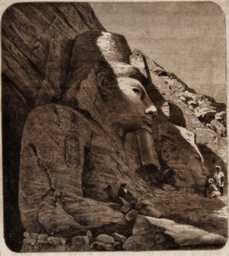 Luckily I turned more to the southward, and so I fell in with what is yet visible of four immense colossal statues cut out of the rock, at a distance of about two hundred yards from the Queen's temple. They stand in a deep recess, excavated in the mountain. It is greatly to be regretted that they are now almost entirely buried beneath the sands, which are blown down here in torrents. The entire head, and part of the chest and arms of one of the statues are above the surface. The head was broken off the one next to it, scarcely any part is visible. The headress only appears of the other two. It is difficult to determine whether these statues are in a sitting or standing posture. Their backs adhere to a projecting portion of rock which may represent a part of a chair or may be merely a column for support. They do not front the river like the Queen's temple, but are turned with their faces due north, towards the more fertile climes of Egypt, so that the line on which they stand forms an angle with the course of the river. The head which is above the surface has a most expressive, youthful countenance, approaching nearer to the Grecian model of beauty than that of any ancient Egyptian figure I have seen. This statue wears the high headress, the arms are covered with hieroglyphics, deeply cut in the sand-stone and well executed, The statue measures seven yards across the shoulders, the ear is one yard and four inches in length. 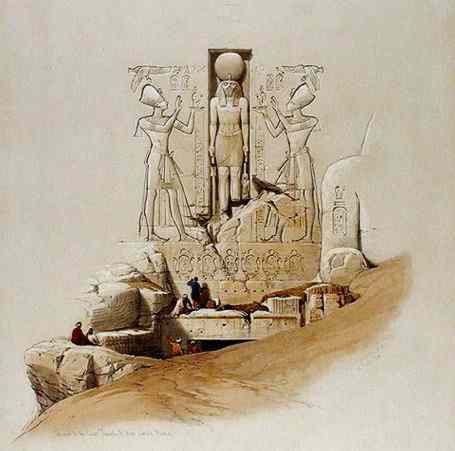 On the wall of the rock, in the center of the four statues, is the figure of the hawk-headed Osiris (now believed to be Ra-Harakhti), surmounted by a globe. I suspect, could the sand be cleared away, a vast temple would be discovered. The colossal figures probably serve as ornaments to the entrance in the same manner as the six on the neighboring temple. The leveled face of the rock behind the colossal figures is covered with hieroglyphic characters. Above is row of upwards of twenty sitting figures, cut out of the rock like the others, but so much worn that I could not make out distinctly from below what they were meant to be. They are about six feet in height. Judging from the features of the colossal statue visible above the sand, I should pronounce these works to belong to the finest period of Egyptian sculpture. A few paces to the south of the four colossal statues is a recess hewn out of the rock with steps leading up to it from the river.